The 14th World Roma Festival “Khamoro” is one of the largest and most significant Roma music festivals in Europe. Khamoro (“Little Sun”) takes its name from a Roma music group that today’s Khamoro festival producers Jelena and Dzemil Silajdzic met at a concert in the Czech Republic in the late 1990s. As Jelena explained to our students in an interview, the concert in question featured performance groups of different ethnicities. The Czech sound engineer provided audio for all non-Roma performers but refused to work with the Roma group. This shocked Jelena and Dzemil, who were refugees from Bosnia living in the Czech Republic. In former Yugoslavia they had worked with famed filmmaker Emir Kusturica, known for films like “Time of the Gypsies.” To help fight against Roma discrimination, they created a week-long music festival and named it Khamoro. In the last 14 years, the most well-known Roma musicians in the world have performed on the stages of Khamoro. The festival features various aspects of Roma culture alongside music and integrates lectures, round tables, and programs for young Roma students and professionals who come to Prague to raise awareness of Roma human rights issues in Europe. The students from University of Pittsburgh and Charles University attend evening concerts at the Khamoro festival. During the day, they attend lectures on Roma music presented by faculty from Charles University and by Roma music researchers from Romania, Hungary/UK and USA. Lectures by Dr. Zuzana Jurkova from Charles University have focused on the history of Roma popular, traditional, and fusion music in Prague. In her lecture on May 28, 2012, Dr. Jurkova analyzed general categories of Roma/Gypsy music into three soundscapes: 1)gadje for gadje; 2) Roma for gadje; 3) Roma for Roma. The first category – gadje for gadje – is music imagined to be “Gypsy” but is sung by gadje (non-Roma) for other non-Roma (Bizet’s opera Carmen is a good example). The second soundscape is Roma/Gypsy music for gadje (for instance, Roma musicians who perform for non-Roma in Budapest’s restaurants); and the third category comprises music that Roma perform for other Roma, meaning popular music entertainment such as Rom Pop (groups like Vera Bila and Kale from the Czech Republic or Romano hip-hop groups such as Gipsy.cz). In each of these so-called soundscapes, the music is performed for a very different purpose and with different understandings of “Gypsiness.” For instance, in the first category, gadje for gadje, there is no real “Gypsy” music – it stems from an imagined emotionality and temperament that non-Roma assume Gypsies to have. The song may be sung in an operatic style, accompanied by piano and sung by a non-Roma woman, but the theme of a Gypsy woman longing for her lover allows the non-Roma singer to add more expressiveness because Roma are stereotyped to be more open with their emotions than non-Roma. In contrast, the third soundscape of Roma performing for other Roma, the music has distinct lyrical, thematic, and stylistic features that function as strong musical markers of Roma ethnic identity (for instance, the use of traditional instruments and lyrics in Romanes, the language of Roma). Dr. Speranta Radulescu from Romania focused her lecture on May 30, 2012 on the musical genre “manele,” a Roma/Turkish-influenced popular music in Romania. Manele is one of the most wide-spread musical genres in Romania’s urban contexts but marginalized among academic circles that, according to Dr. Radulescu consider it a pariah music that will destroy Romania’s sense of morality and peasant purity if not controlled. (For instance, manele is not featured on Romania’s state-run television channels, only in privately controlled media.) Dr. Radulescu explained that it is difficult for university researchers to get information about manele because those on the scene do not disclose much information with the fear that intellectuals will present the music in a negative light. She shared her fieldwork videos of a manele musician receiving a 500 Euro tip from a wedding guest being entertained by the singer at his table. She also mentioned that many manele musicians use cocaine and that cocaine is readily available in many clubs and this is one of the main reasons why those on the scene try to keep out the music researchers who may disclose their drug associations. Oops! 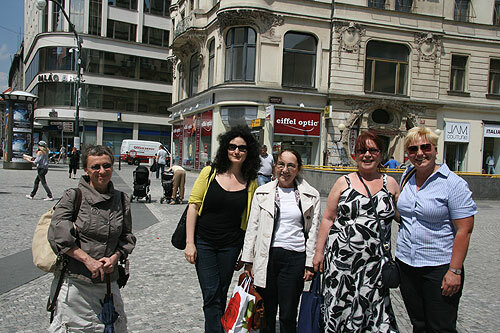 Dr. Iren Kertesz-Wilkinson, a researcher from Hungary living in London, shared her experiences with our students on May 31, 2012. She focused her lecture on her fieldwork living in a Roma community in southern Hungary in the late 1980s. This type of immersion research of living with Roma families was rarely done by non-Roma researchers because it was deemed socially and intellectually inappropriate. Dr. Kertesz-Wilkinson spoke about the cultural differences among the Vlach Roma in the northern parts of Hungary and the more assimilated Romungro whose language is a mix of Hungarian and Romanes. She focused her lecture on fieldwork methods and the central role that music-making plays in ethnomusicological research. She recognized that as an ethnic Hungarian, she acquired singing skills in the local repertoire differently than Roma. When first hearing a song, she focused on learning the melody. In contrast, Roma children learn songs by mimicking improvisations and ornamentations, singing pieces of melody and text with nasal motifs. The difference lies in the different values Roma and non-Roma societies place on different musical characteristics – for Hungarians, the emphasis appears to be on melody; for certain Roma communities in Hungary, the aspects that define “good” music are a nasal vocal timbre and melodic ornamentation. Dr. Adriana Helbig’s lecture on May 29, 2012, drew on her research among impoverished Roma communities in Transcarpathia, Ukraine, close to the Hungarian and Slovak borders. Conducting fieldwork at a time of great poverty in the early 2000s, Dr. Helbig faced the challenge of conducting research among musicians who had sold their instruments to make ends meet. She eventually bought instruments, brought them to Roma villages, leaving them with musicians for a few weeks at a time and returning to record. Dr. Helbig stressed the emotional aspects of fieldwork and how an ethnographer’s identity shapes the ethnographic exchange through factors such as gender, age, ethnicity, race, and class. During her fieldwork, she used her English-language writing skills to help Roma non-governmental organizations procure grants for educational programs, music and culture projects, and media production. She stated that since many Roma music and cultural events such as the Khamoro festival are sponsored by non-governmental organizations, city councils, and various European funds, music plays an important role in drawing attention to Roma rights issues. A write-up of the University of Pittsburgh’s Romani/Gypsy music study abroad program in the official program of the Khamoro festival shows that the students have become an integral part of the Roma rights movement and help draw awareness to Roma discrimination worldwide through the lens of music. Veronika Seidlova, a doctoral student in ethnomusicology at Charles University, augmented our knowledge of minority musics in the Czech Republic with a lecture June 1, 2012,on Jewish music in Prague before and after WWII. Veronika had discovered recordings of Jewish services in the synagogue made by cantor Ladislav Moshe Blum (1911-1994). Blum made the recordings, although it is considered inappropriate to record religious music used in services. Nevertheless, there was no young cantor to learn the tradition from him, and he felt it was better to go against religious law than to have the music die out. The recordings reveal the use of organ and compositional singing in Western classical four-part harmony in the Old-New Synagogue in Prague as late as the 1980s. In fact, the styles of many cantors such as David Rubin and Salomon Sulzer sung before the war fall in line with such musical assimilations that were popular in the Jewish synagogues in Prague. Since the 1990s, this type of music is viewed by Czech Jewish converts as “not Jewish enough,” revealing tensions in how Jewish identity is expressed musically in Prague today. With so much information to absorb in a short period of time, our students write 500 words in their field notes every day. Writing helps them process their experiences and emotions, and make sense of the wealth of information they acquire in lectures, at concerts, in interviews, and in conversations with new Czech and Roma friends. 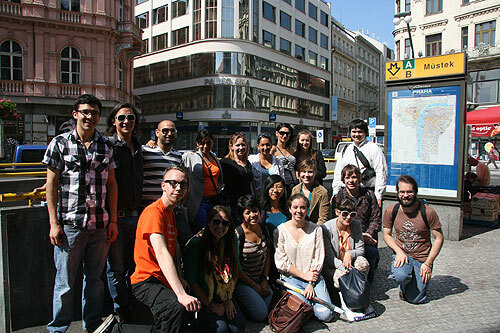 Students from the University of Pittsburgh study abroad program, Charles University, and Roma students from Romania, Serbia, and Slovakia who are taking part in a Khamoro-associated course for Roma cultural production managers (May 30, 2012). It is an understatement to say that we are experiencing sensory overload at the end of our first week in Prague. In their lectures, each professor has stressed that this is a very normal feeling and that new insights and understandings will emerge from our experiences for years to come. Eventually the kaleidoscope will seemingly stop spinning, or at least we will become more perceptive, and the seemingly unrelated facts and feelings will begin to crystallize into coherent ideas and understandings. For the moment, we rely on each other to gain a sense of reality in a context that continues to shift with each moment in the field.